Updated June 12: We won our division! First place in "Men". We're both thrilled and a bit surprised! Since everyone starts at different times, we had no idea until yesterday. Really rewarding, we have put some time into it and we have come a long way! Still a long way to go to compete with the real top dogs out there, but feels pretty good! This was the 46th (!) annual Canoe the Nonquon event. And my 2nd... here's the report from our first. Last year - we had really just got into the whole canoe thing. We had our 17'6" Jenson canoe, but we were total newbies. Worst of all, once we left the Nonquon River, we entered the lake and hit the worst headwind we'd ever paddled against. The last 8km felt like an eternity. This year... no wind! Beautiful day. And - they cut 5km from the Nonquon river due to unspecified "river conditions". So a much easier day. There was still a pretty twisty river portion included, and this year it featured waaaay worse algae/weeds/lilly paddies. 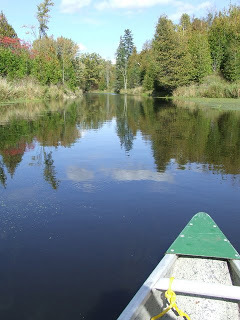 The channel of clear water was really narrow, so an 17' foot canoe was far from ideal to navigate it! We used our old wooden paddles to avoid breaking carbon on logs/rocks... it was a bit tough. We were definitely faster last year through this section. Then it opens into a wider river section, where we could switch to carbon fibre paddles. What a difference - our speed went from the 7's up to the 8's and 9's (km/h) immediately. We had less traffic to deal with generally, having started a bit earlier. Picked off a few people early on. As we exited to the lake, we caught "white canoe"... two really strong looking young paddlers, one man, one woman. Hate to generalize (ok, I don't hate it that much!) but they looked like gym folk. Strong. We took a shorter line through some algae just after we caught them, fully expecting to emerge ahead and never see them again. Wrong! They busted their butts to keep just in front of us. We ducked into their wake for a little, caught some draught... but then they seemed to run out of gas. We moved to one side, passed them, and then put some serious distance between us and them in very short order! It was rewarding, they had a good boat (but shite paddles)... but ultimately we'll have to wait for results to see how we stacked up against allll of the hard-core canoe crowd. Ultimately it felt good. The carbon paddles made a big difference, and it was interesting over the 2+ hours that my arms didn't fatigue at all - suggests I'm paddling with the "right" bits, ie. the core, not the arms. We're getting better - by the time we're as old as the average marathon paddler, we should have this thing licked! Next week we're paddling in the Moraine Relay, can't wait to see how we measure up against the really awesome guys!